6 x 10 Rockwell Flat Black Floor Register Discounts Apply ! These black vents are crafted of all steel construction including a steel core. 6 x 10 Floor registers offer a fully operational steel damper for air comfort control. Black vents offer a classic Arts and Crafts mission design that is timeless. 6 x 10 floor registers can also be adapted for the wall if you use wall clips (order separately). Black vents offer one step drop-in style installation. 6 x 10 floor registers have a matte finish for an understated yet elegant look. ***Hint: When ordering your 6 x 10 floor register, industry standards ask that you measure using the actual duct hole opening dimensions and not your existing register's faceplate dimension. These Mission style black floor vents will fit a 6 x 10 inch hole opening. You can also use these black vents on your walls. Use spring clips to attach to wall. 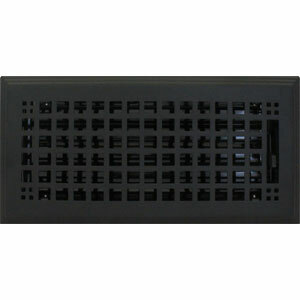 6 x 10 floor register black vents offer a classic design with a matte finish suitable for home or office, order today.